HALALA, farmers of Grain SA! HALALA, Grain SA Farmer Development team! Once again farmers, many wearing their colourful traditional outfits, gathered in Bloemfontein from all corners of South Africa to spend a happy day together acknowledging growth, progress and hard work and to celebrate their successes. 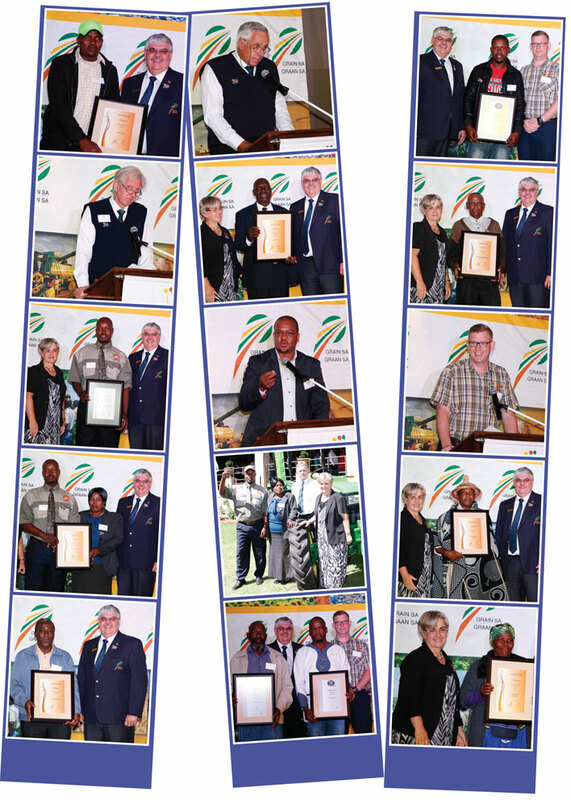 It was a DAY OF CELEBRATION for the Grain SA team and the members of Grain SA’s Farmer Development programme – and a day to recognise the progress at grass-roots because of the hard work of dedicated men and women who work their fields and produce food for their families and the nation. The air around the venue was filled with happy sounds produced by the marimba players accompanied by friendly greetings as people met friends from far corners of the country. A welcoming cup of tea with refreshments was enjoyed and then it was time to hear the good news of who were the finalists and winners of each of the three categories: Subsistence Farmer of the Year, Smallholder Farmer of the Year and New Era Commercial Farmer of the Year. Regional Managers Johan Kriel and Danie van den Berg thanked the members of the Judging Panels who had travelled thousands of kilometres and had the difficult task of selecting the winners for each category. It was most noticeable that each and every nominee had grown their farming operations in some way or other. Many told of dramatic increases in their yields simply because they had better knowledge of the best practices for their area and they had learnt more about the importance of weed control, soil health and seed selection. It is exciting to hear how a few small changes in their farming practices have resulted in dramatic increases in their returns which has motivated them to plant more crops and grow their farming operations. How wonderful to hear that one farmer was able to feed his household and sell the excess for cash so that he can provide for his family and keep them healthy! In the world of development it is not always the huge farming operations that count…small improvements can change lives in rural areas – that’s what matters! Many farmers told us that even though the 2014 - 2015 season was dry, they still harvested decent crops. This was the result of valued advice received from Grain SA’s team and mentors. The farmers spoke of wonderful relationships with Grain SA mentors who help them with advice in their fields. Many also emphasised the value of building good relationships with commercial farmers as well as the agribusinesses. One farmer said that he gets expert advice on sprayer calibration/application every season because the products and dosages can change every year. The improvements were the result of better weed control, soil sampling, seed cultivar selection, practising crop rotation and implementing no-till conservation farming. Small improvements have returned amazing results. The farmers emphasised the importance of business and financial management. Many have attended Grain SA’s business and financial management courses. All the winners said they have attended Grain SA courses themselves but they are also empowering their workers by sending them on the courses as well. It was heart-warming to see how many of the leading farmers paid tribute to their wives, sons and daughters who are committed to help build successful farming operations giving support in the fields, in office management and helping with marketing. 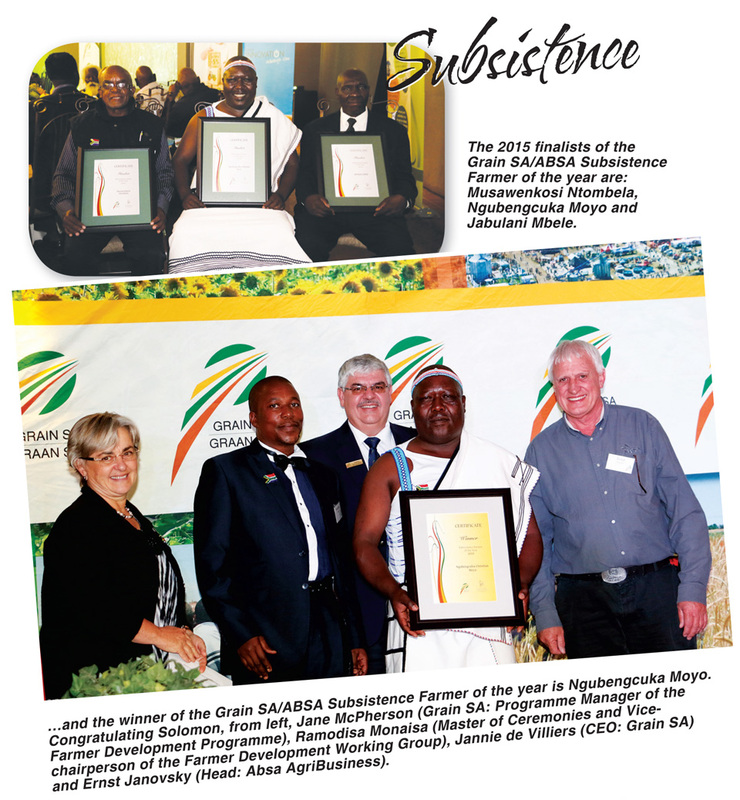 The winner of the Grain SA/ABSA Subsistence Farmer of the Year, 2015 is Ngubengcuka Moyo who is mentored by Lawrence Lutango from the Mthatha office. He does all his farming manually and has improved his yields by using a hand planter and a knapsack sprayer. He chooses to farm using no-till methods and is happy that this is helping him to conserve the land for future generations. He lives in a remote region with limited infrastructure and says his biggest challenge is in marketing his crop. 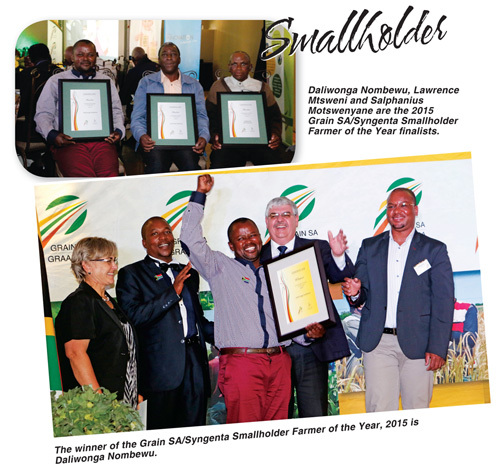 The winner of the Grain SA/Syngenta Smallholder Farmer of the Year, 2015 is Daliwonga Nombewu from the Eastern Cape. His Grain SA regional manager is Vusi Ngesi based in Maclear. Even in this dry season his 13 ha of maize yielded on average 4,5 t/ha. This young farmer has been so inspired that he is planning to grow by renting additional lands. He believes it is important to spread ones risks and he also grows dry beans, potatoes and spinach which are in demand locally and boosts his cash flow. He paid tribute to his wife who works hand in hand with him in the farming business and together they focus on good office management practices. 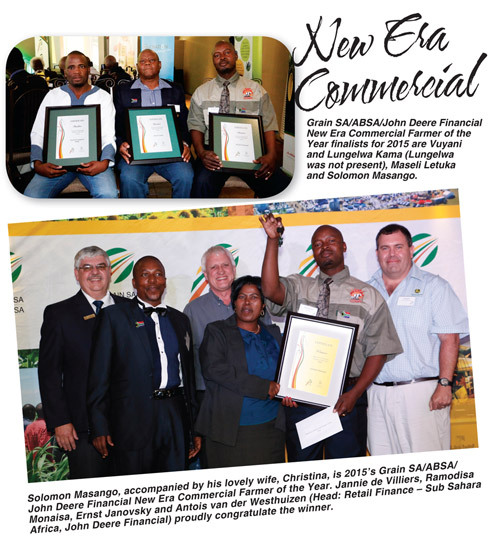 The Grain SA/ABSA/John Deere Financial New Era Commercial Farmer of the Year, 2015 is Solomon Masango. Solomon farms near Carolina and his Grain SA Development Co-ordinator is the recently retired, Naas Gouws. (Jurie Mentz recently took over the co-ordinator reigns). Solomon practices no-till farming and plants maize, soya and sugar beans. He emphasises the importance of good relationships with other farmers and advisors who helps him with his planning. He believes it is important to look ahead and plan in advance for the next season. Solomon values his farm workers and even plants a few hectares for each of them. He has seen amazing progress and his yields have grown from 3,5 t/ha to 6 t/ha. No wonder he is found to be a worthy winner who is taking home the grand prize: A brand new John Deere 5403 MFWD 48 kW tractor. 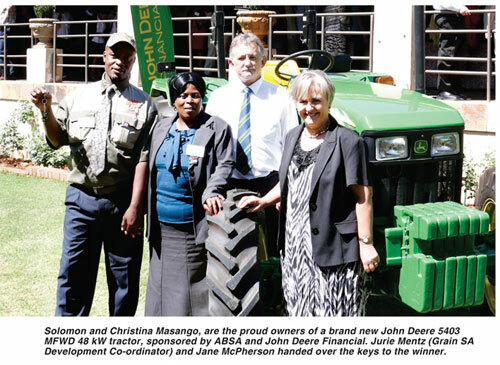 This is the biggest prize we have ever had thanks to the partnership between ABSA and John Deere Financial. Wow, what a celebration we had! Tears of joy and stunned disbelief were all mixed up on Solomon and his wife’s faces as they let the news sink in. A hearty luncheon was enjoyed amidst sounds of ululating and a John Deere tractor being started up again and again as fellow farmers admired Solomon’s prize. Slowly the farmers left for home, back to working with the rhythm of the sun and the seasons – working in their fields close to Mother Nature and filled with new inspiration and hopes of experiencing rewards in due season. Thank you to the generous sponsors of the competitions and to all the other supporters and friends of the Grain SA Farmer Development Programme who came to share in this DAY OF CELEBRATION and left for home with large smiles and warmed hearts – because an encounter with the farmers of South Africa ALWAYS does that to one! Long live Grain SA! Long live Grain SA Farmer Development! Article submitted by Jenny Mathews, Pula Imvula contributor.